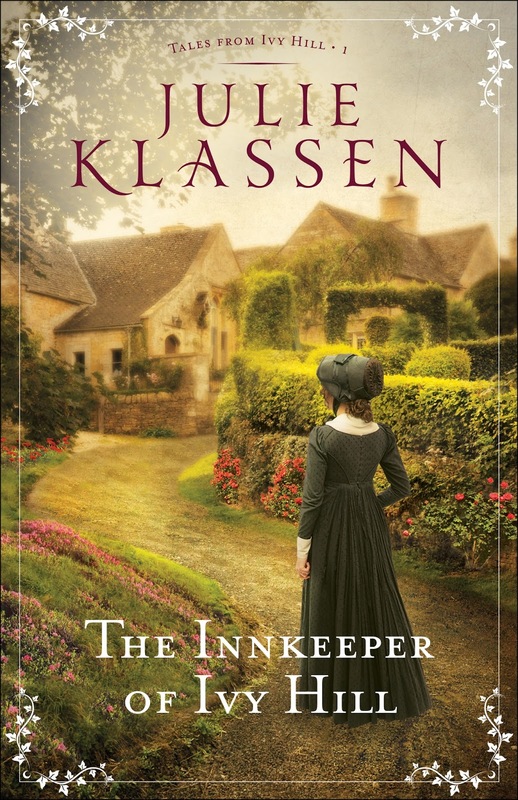 One of my favorite author's is Julie Klassen! She wrights regency novels with the best of them. To find out she's written the first book in her first series made me ecstatic! I was also thrilled to find out I was going to be able to review it for Bethany House Publishers! I'm sure I've mentioned it before, but Julie Klassen is an author who, I don't care if she were to write about jelly beans, I'd pick up her book sight unseen! Yes, I love her as an author that much. We're introduced to Jane and her MIL, Thora, right away in the story. We also get to know quite a few other characters as well such as Mercy, Rachel, Gabriel Locke, Sir Timothy, and Mr. Drake. The Innkeeper of Ivy Hill lends the reader the opportunity to get to know the cast of characters. I like this in that, I feel like I get to know the town instead of just focusing on a few people. In a way the town comes alive before our eyes. Thora is the matriarch who is critical of everyone. Jane, the new owner of the inn, isn't sure if she's up for the task of running the in, and with a loan due, she has to decide if she wants to keep it running or bail out. Her mother-in-law as well as her recently returned brother-in-law don't give her much confidence in her ability to run The Bell or that it's able to even be saved. One of the aspects of this book that I enjoyed is that the reader is brought into a maze of relationships. There are friendships that have been around since Jane was a child and some are new. No clear cut romantic relationships are spelled out throughout the story, which kind of made me crazy, but in a good way. It kept me reading and trying to figure out who I'd want Jane, Thora, or even Rachel to end up with. I'm hoping Rachel plays a bigger part in the next book and we learn more about the history between her and Jane! I also like the men in the story as well. They each brought a different personality to the storylines, all except Sir Timothy who we didn't get to know as much as the other men. Patrick I couldn't peg very well. I think I was biased based on the history he'd had with the other characters. Hopefully we'll see some redeeming qualities in the next book. The story itself pulls the reader along as we get to know the town and the characters. As with any town, there are a lot of intricacies with people who have grown up together, and been in different social statuses. I didn't read this novel like I typically do with Julie's stories. This one took a bit longer. I think because she had to define so many characters in the story it was a longer novel. There was some mystery involving Jane's husband's passing that keeps the reader wondering about his death. As I got towards the end of the book, with say 3-4 chapters left I told myself to slow down my reading because I was going to have to wait months before the next book comes out. Unfortunately, I finished it quicker than I wanted, but was happy with the ending knowing more was to come! What book really excited you for the next one to come out?